inserts allow food service establishments to transport kitchen quality food to customers at the desired temperature whether it be hot, cold or frozen. Better yet, with our vehicles, the typical delivery radius and the quantity of deliveries possible are shattered. At Delivery Concepts, we know that being static with our proven products would work, but we have bigger dreams. With innovations coming every single year, we are always ahead of the curve in mobile food transport. We understand being environmentally responsible as well. With our electric vehicle series, we’re keeping the carbon emissions low, saving customers money on traditional fuel costs, and providing an ideal option for those looking to deliver in smaller, campus-like settings. Our signature Polyurea interior is a material that is nearly impossible to damage, and makes cleaning the inside of your truck a swift and simple process. Our trucks are designed to fit each customer’s unique wants and needs. This means working with customers directly to find the right solution to every food-transport need. 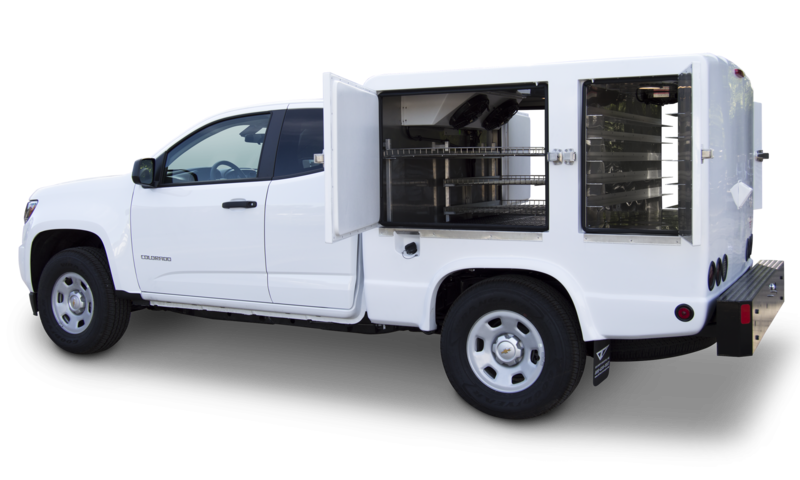 Shelving options and rack placement are highly customizable, as are other various features with the vehicles such as unique and impressive wraps that transform vehicles into mobile billboards. When working with DCI, the answer is never simply, “no”. We will always strive to find the most logical and cost-efficient answer. At DCI, we aim to build lasting relationships with our customers that are built on quality, consistency and being the best mobile food-transport company on the market. The best way to get started working with DCI is to Contact Us. We look forward to hearing from you!